Russian composer Peter Illyich Boroff (Sonneveld) is living and working in Paris, France. Film producer Steve Canfield (Astaire) plans to use Boroff as the composer for his upcoming musical film, but this is complicated when three comrades from Russia — Comrades Brankov (Lorre), Bibinski (Munshin) and Ivanov (Buloff) — come to Paris to take Boroff back to Russia. However, Canfield steps in and charms the comrades with the highlights of Paris in the spring. Russia sends Ninotchka Yoschenko (Charisse) to Paris to bring Boroff and the comrades home, and Canfield works to charm her with Paris as well. 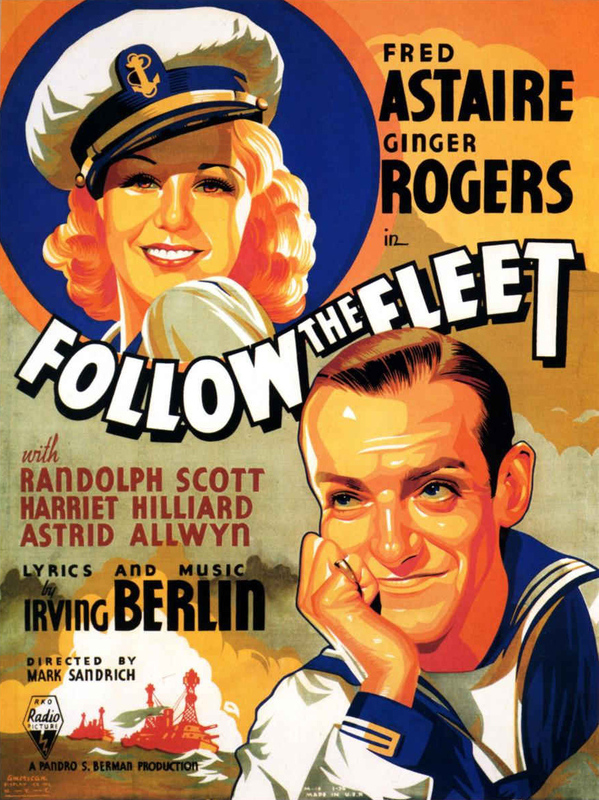 -This was Fred Astaire and Ginger Rogers’ second film together (out of 10 films). Following their success in “Flying Down to Rio” (1933), RKO teamed them together again. -“The Continental” lasts 17.5 minutes. This was the longest musical number until Gene Kelly’s ballet in “An American In Paris” (1951). -Based on the 1932 Broadway show “The Gay Divorce,” which starred Fred Astaire and Claire Luce. For the film, the title was changed to “Divorcee.” Fred Astaire’s autobiography “Steps in Time” says the change was to show that the film was about the amorous adventures of a woman. Bake Baker (Astaire) joined the Navy after his former dance partner Sherry Martin (Rogers) turned him down when he asked her to marry him. Now he’s back on shore leave and he meets her by chance at a 10 cents a dance joint. Sherry’s bookish sister Connie (Hilliard) meets Bake’s sea mate Bilge Smith (Scott) and falls in love with him. But Bilge isn’t read to settle down and starts running around with a rich divorcee. -This movie was made after the success of “Roberta.” RKO wanted to bring Randolph Scott and Irene Dunne back together again for another film with Fred Astaire and Ginger Rogers as the secondary leads, according to TCM host Robert Osborne. 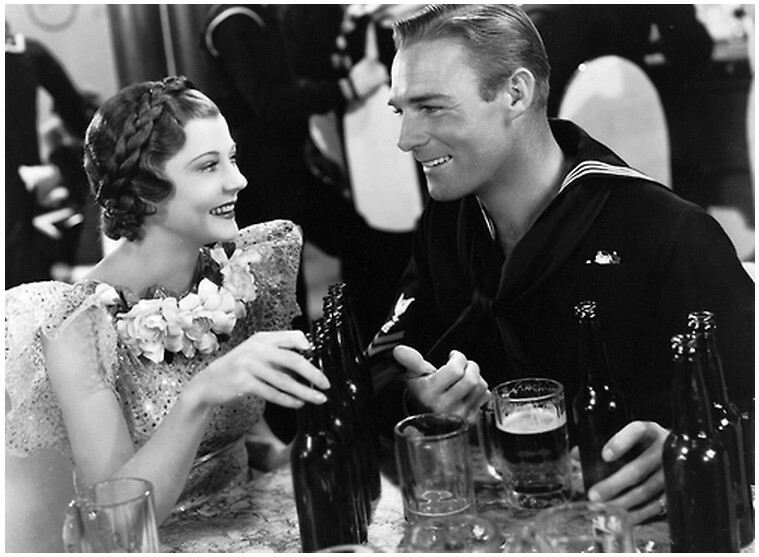 Dunne’s contract expired with RKO and she went on to star in “Showboat” (1936). New comer Harriet Hilliard was selected to fill the Irene Dunne role, Osborne said. -The beaded dress Ginger Rogers wears in “Let’s Face the Music and Dance” was very heavy. Fred Astaire said the dress was too heavy to be made for dancing. During the first take, a long sleeve hit Astaire in the face. After 20 more takes, Astaire felt like the first take was their best, said Robert Osborne. -Fred Astaire and Ginger Rogers’ fifth film together. 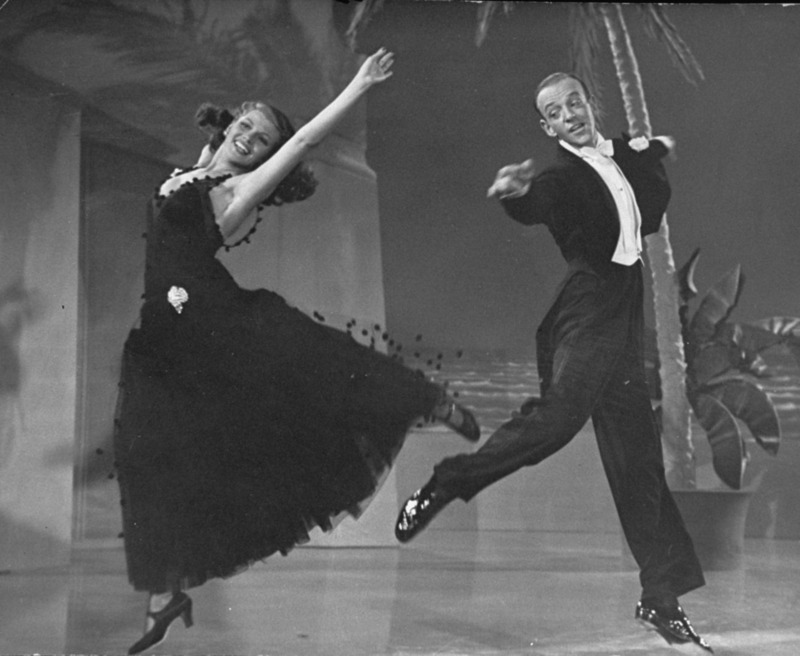 -The couple in the dance contest with Astaire and Rogers were unknowns picked by choreographer Hermes Pan. -Lucille Ball and Betty Grable have small roles in the film. -Actor/singer Tony Martin has an uncredited role in the film. -Ginger Rogers and Fred Astaire in the dance contest. They do impressive dance steps and Rogers is wearing pants so you can actually see the dance moves she’s doing. While this was following the success of “Roberta,” it isn’t quite as good as “Roberta.” Harriet Hilliard is fine, but I would have loved to see Irene Dunne in the role. The music in this Astaire and Rogers film is terrific since the score is written by Irving Berlin. 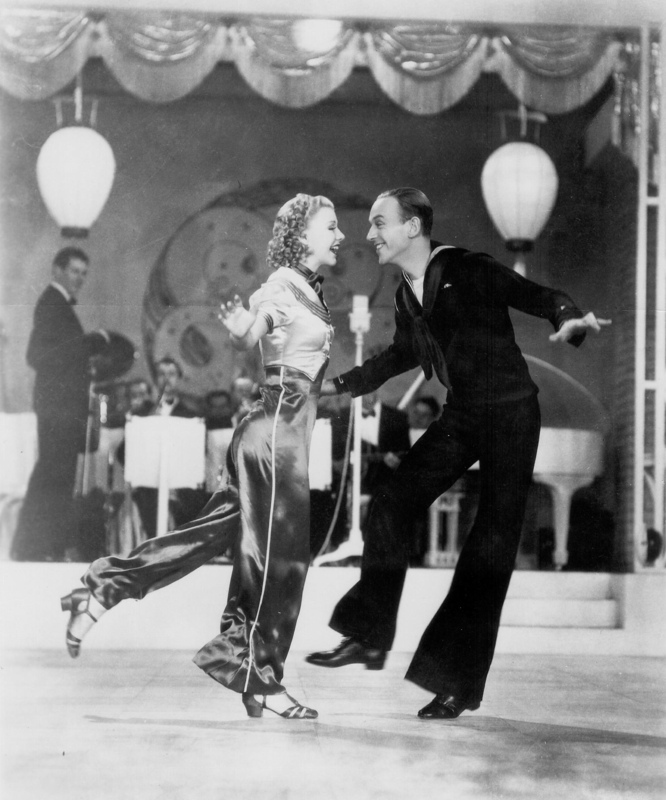 It is also a real treat that all but one of Rogers’ dance performances are done in pants so you can see her footwork better than when she is wearing a ballgown. The plot isn’t bad but some of the lines said in the film could be bothersome to the contemporary viewer. Such as Ginger Rogers saying you have to be dumb to get a man. Or that Harriet salvages a boat for a man she doesn’t even know. Regardless of my issues with silly parts of the plot, if you are a Fred Astaire and Ginger Rogers fan, this is definitely a movie you should see. Broadway choreographer Robert Curtis (Fred Astaire) gets mixed up in the philandering of producer Martin Cortland (Benchley). Cortland buys a bracelet for a pretty chorus girl Shelia Winthrop (Hayworth) but Cortland’s wife (Frieda Inescourt) find the bracelet after Shelia refuses it. Robert gets mixed up in Courtland’s explanations to his wife, and is able to escape the confusion when he is drafted into the Army. -Rita Hayworth’s first starring role in a large budget film for Columbia Pictures. It was successful at the box office and turned Hayworth into a star. -During the filming of this movie, the famous LIFE photo of Rita Hayworth in a negligee on a bed was published, making her even more famous along with this movie. -Nominated for two Academy Awards: Best Music, Original Score by Cole Porter for the song “Since I Kissed My Baby Goodbye.” The second was for Best Music, Scoring of a Musical Picture by Morris Stoloff. “She’s a natural. She’s constantly surprising me. Nothing is too difficult for her. She watches, goes up, practices up and the next day she has it perfect,” in the Oct. 1941, “Born to Dance-Together” in Movie Stars Parade. -The film begins with Robert Benchley riding in a vehicle. He tells the chauffeur to slow down and we see the credits in the form of billboards along the road. -The first musical number is an interesting dance number that mixes modern dance and tap dancing together. -Fred Astaire and Rita Hayworth’s duet tap dance at the beginning of the film when Astaire is showing her how to do a dance in the show. The number show’s off just how good a dancer Hayworth is. 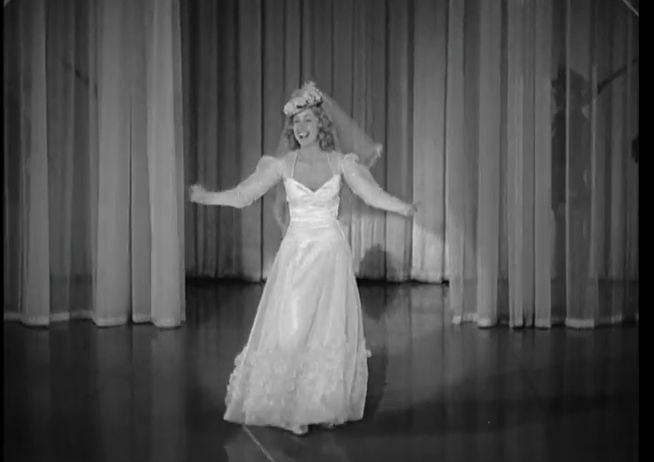 -Popular 1940s singer Martha Tilton shows up at the end as a specialty performance for the “Wedding Cake Walk” number. 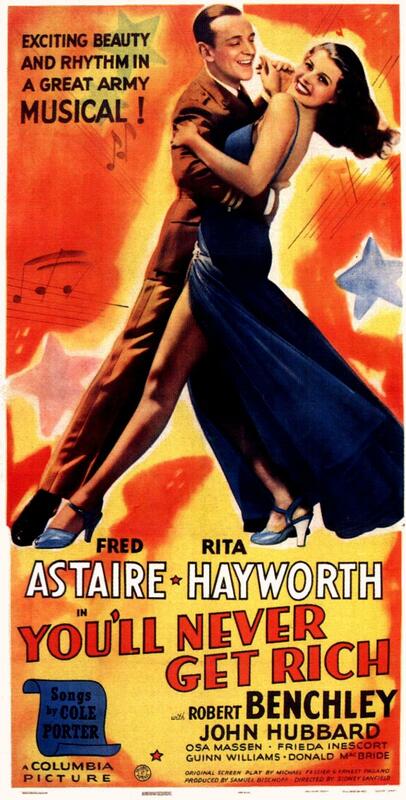 The biggest point of interest with “You’ll Never Get Rich” is this is the film that made Rita Hayworth a star and showed Fred Astaire could have other dancing partners besides Ginger Rogers. While Fred Astaire sings a few songs and we hear two songs from the Four Tones group, this musical seems to focus more on dancing. It’s a vehicle for Rita Hayworth, showing off how good of a dancer she is, so she isn’t dubbed like she is in musicals in the future. The plot is a bit zany and runs on miscommunication jokes, however it’s a fairly cute and entertaining film. The thing that stands out the most are the excellent dancing numbers with Rita Hayworth and Fred Astaire. Rita Hayworth and Fred Astaire dancing in the “So Near and Yet So Far” number. Singer Jim Hardy (Bing Crosby) and dancer Ted Hanover (Fred Astaire) are both in love with Lila Dixon (Virginia Dale). When Lila jilts Jim for Ted, Jim decides to quit show business and live on a farm.Jim ends up converting his farm into a nightclub and hotel called the Holiday Inn which is only opened during the 15 holidays of the year. When Jim meets Linda Mason (Marjorie Reynolds), she agrees to appear in his shows at the inn, and the two fall in love. However, Jim works to keep Linda from meeting Ted -who was also jilted by Lila-so he doesn’t steal her for an act and her heart. -The hotel chain Holiday Inn was inspired by the title of this film, according to the hotel founder Kemmons Wilson’s New York times obituary. 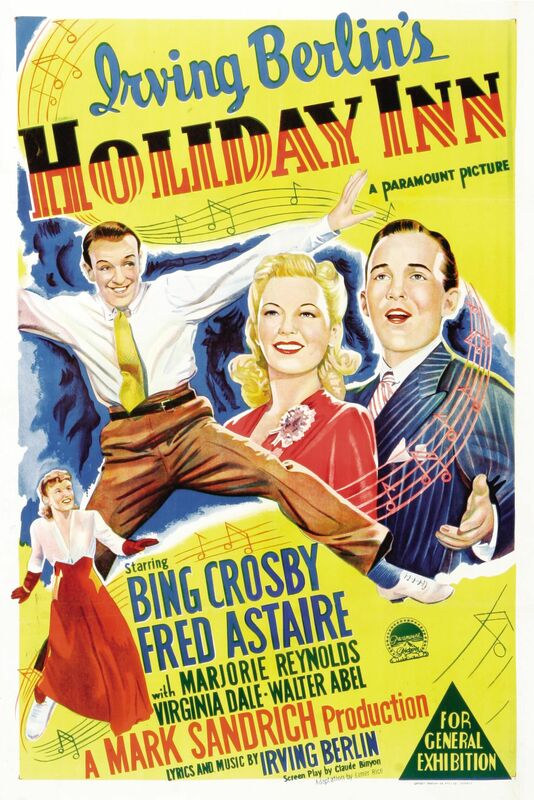 -This film introduced the song “White Christmas.” Irving Berlin thought of the song “White Christmas” in 1935 on the set of “Top Hat” and wanted to use it for a Fred Astaire-Ginger Rogers film. Astaire liked the tune but it was never used until their film. Irving Berlin and Moss Hart worked and copyrighted the idea for a musical revue revolving around tunes for each holiday, according to “The Complete Lyrics of Irving Berlin” by Robert Kimball and Linda Emmett. – Irving Berlin had a hard time writing the Christmas song “White Christmas” since he was Jewish. He ran the song by Bing Crosby, who thought it would be great, according to “Christmas’s Most Wanted” by Kevin Cuddihy. 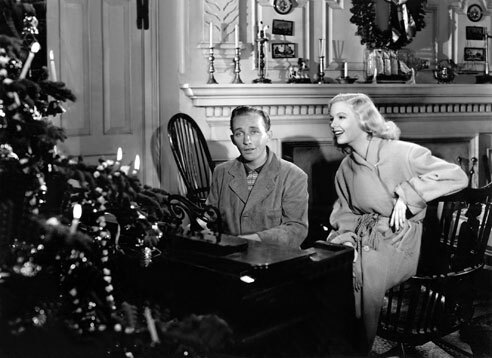 Bing Crosby and Marjorie Reynolds (dubbed by Martha Mears) sing “White Christmas” which became a hit due to this film. -The film originally was supposed include a dance number for Labor Day. -Mary Martin turned down the role of Linda played by Marjorie Reynolds because she was pregnant, according to her autobiography. -Fred Astaire’s shoes he danced in during the Firecracker routine were auctioned off for $116,000 that went towards the war effort. -Paramount Pictures did not market this film as a Christmas movie since it covers many other holidays, according to “World War II and the Postwar Years in America” by William and Nancy Young. Fred Astaire in firecracker number for the Fourth of July. -The Fourth of July number was expanded and made more patriotic after the bombing of Pearl Harbor; including the song “Song of Freedom,” “Let’s Say it with Firecrackers” and a movie reel of war workers and soldiers marching. -Won an Academy Award for Best Original Song- “White Christmas” by Irving Berlin. It was nominated for an Academy Award for Best Score by Robert Emmett Dolan and Best Original Story by Irving Berlin. -Marjorie Reynolds is dubbed by Martha Mears. 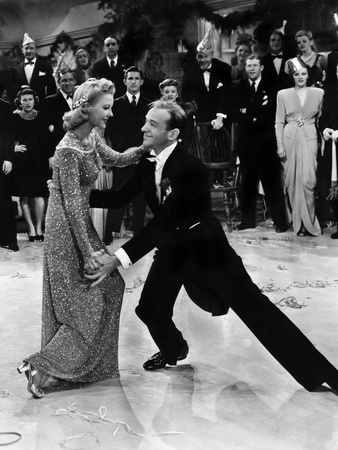 Fred Astaire dances with Marjorie Reynolds during the New Years scene where he took drinks of bourbon before each take. 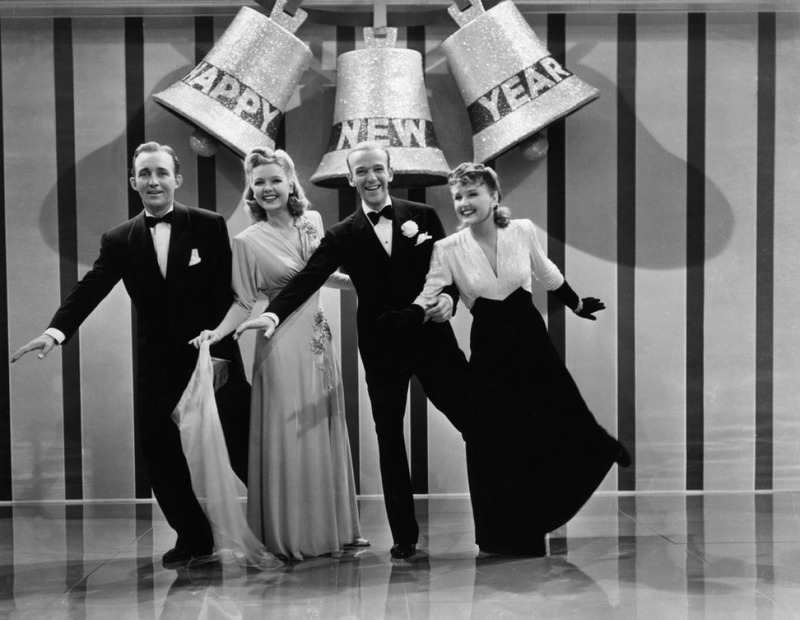 -Fred Astaire’s drunken New Years Eve dance. Supposedly Astaire had a drink of bourbon before each take-it took seven-to appear drunk in the scene. 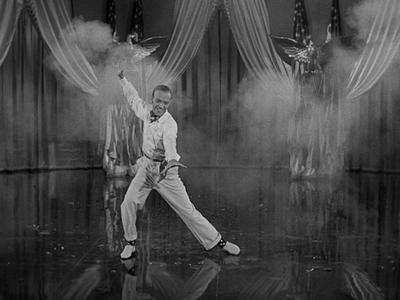 -Fred Astaire’s “Say it With Fireworks” dance for the Fourth of July number where he throws down fireworks while he taps. -The cartoon turkey on the calendar that runs between the dates for Thanksgiving Day. This is referring to “Franksgiving,” a controversy that occurred during the Roosevelt administration. President Roosevelt wanted to make Thanksgiving a week earlier. -“White Christmas” sung by Bing Crosby. This is the most famous song in the movie. The version sung by Cosby in the movie is the one you hear most on the radio. -“I Can’t Tell a Life” sung by Fred Astaire for Washington’s Birthday dressed in period clothing. -“Easter Parade” sung by Bing Crosby to Marjorie Reynolds for the Easter portion. When I first saw this movie several years ago, I didn’t like it. I thought Fred Astaire was a bit of a heel and had no redeeming features. However, as I rewatch it, I see both men are heels at different points in the movie. Characters aside- the thing that stands out the most is the music-all revolving around holidays. Irving Berlin’s songs written for each holiday are catchy and clever. Fred Astaire also is able to show off his dancing abilities both with partners and in solo numbers. Bing Crosby has an excellent score and sings the song he is most remembered for. “Holiday Inn” is an interesting topic for a film and is musically beautiful. If you are looking for a Christmas movie, it doesn’t completely revolve around the holiday (but Christmas is in the film three times) and introduced one of the most loved holiday songs.